Spider-Gwen has been one of my favorite Marvel books for a while now. 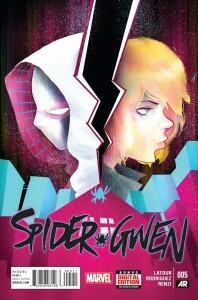 The book explores a universe where it was Peter Parker rather than Gwen Stacy who faced a tragic demise and follows Gwen on her adventures as a web-slinging superhero. Exploring this new world is exciting as we are introduced to brand new characters along with some familiar faces in unfamiliar roles. The first issue of Inferno introduced us to a world where Magick is lost to Limbo and Hell has come to Battleworld. This version of the X-Men are no longer fighting only the demons of prejudice but instead are battling literal demons that threaten to take over their area of Battleworld. The last issue left off with the X-men being captured by these infernal forces. Hopefully, in this issue, we will see the X-Men prevail. 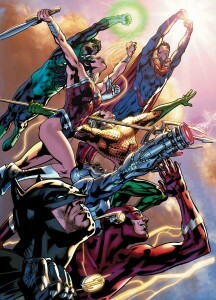 This is the first issue that takes place after the death of Batman. It will be interesting to see what happens when someone other than Bruce Wayne picks up the mantle of Batman. 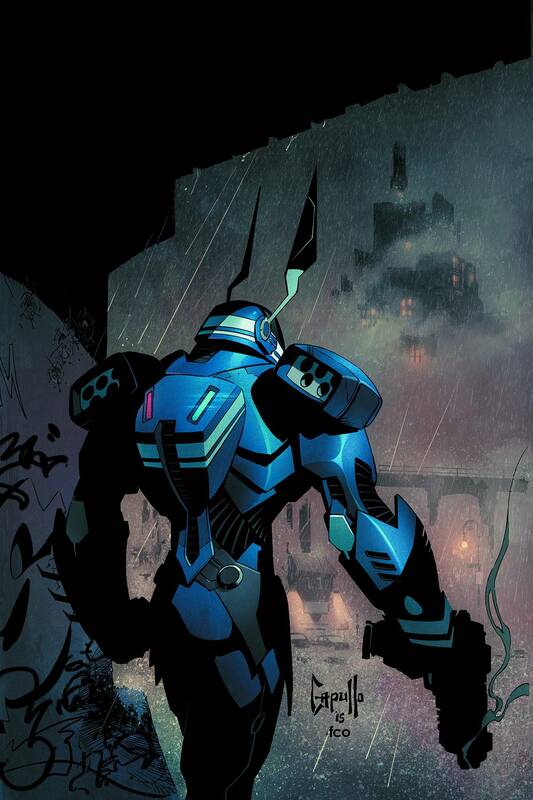 How will the city of Gotham react, let alone all of Bruce’s allies? Will they rally behind this new Bat or will they revolt? 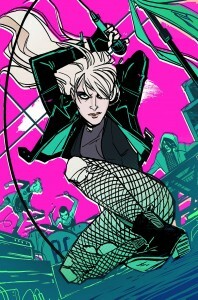 I cannot wait to pick up this issue to see what happens! This series has been amazing from the start. 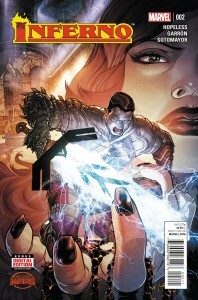 If you haven’t picked up the first two issues I highly recommend it. Hickman has been crafting this event since he started writing Avengers. His story culminates with the Marvel Universe, and all other universes, destroyed. 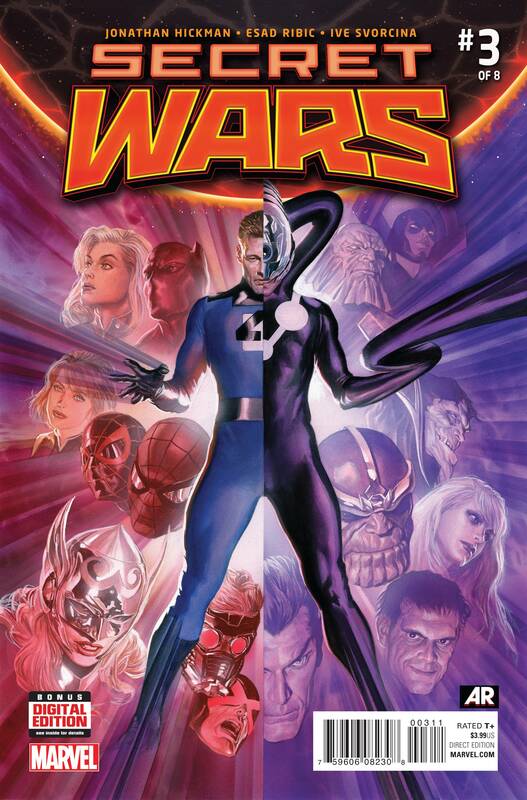 All that is left is Battleworld, a new world stitched together out of these doomed universes. 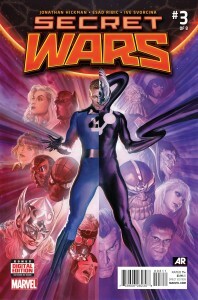 Secret Wars takes us on an interesting journey, describing how the bits and pieces of the various Marvel Universes get along in this new status quo. 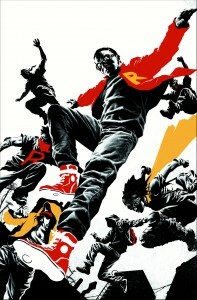 This series is written and drawn by Skottie Young. ‘Nuff Said! 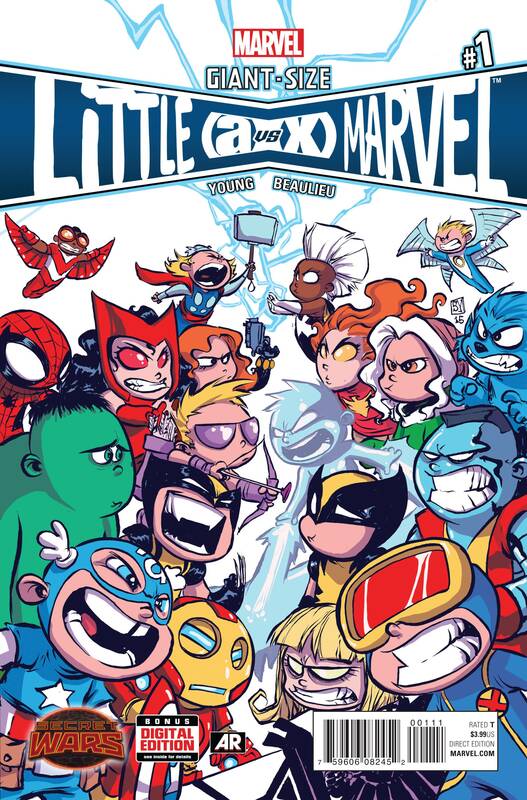 Seriously though, as you already know or will know from my future posts, I’m a huge Skottie Young fan, so when I saw this was written and drawn by him I knew I was going to pick it up. 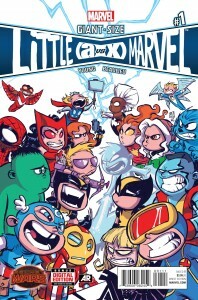 Skottie tells the story of his kid version of the Marvel Universe and their day-to-day lives. What’s more fun than seeing kid versions of your favorite Marvel superheroes? Future Imperfect is the continuation of a Marvel two-part story from 1992. 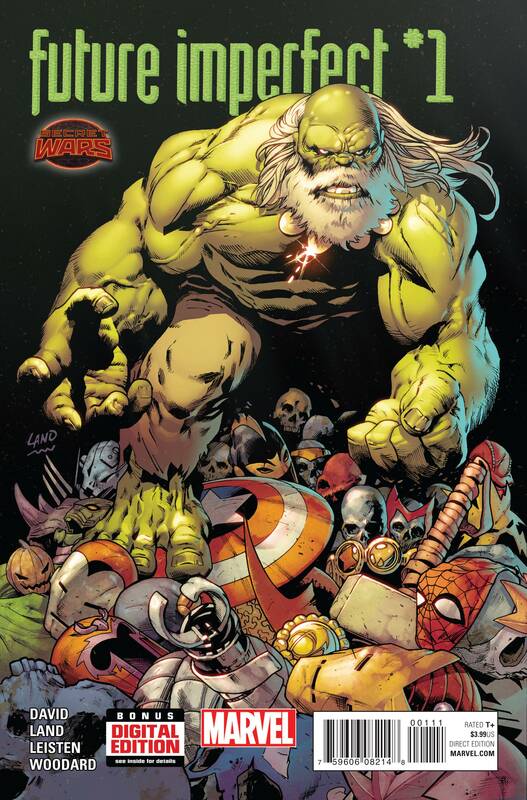 We see an older Hulk who has become the ultimate villain, the Maestro. 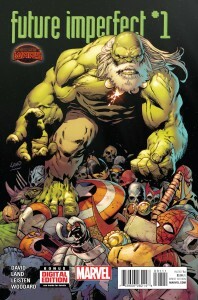 For me any story that shows the Hulk as something more than a big bumbling idiot, I’m game to read it. Throw in the fact he is a genius villain, please just pull me the entire series. The Hulk is the strongest, so why not make him the smartest and the most evil super genius ever? I’m curious to see how he fits into the Battleworld. Based on the 2013 Marvel Crossover Storyline, The Age of Ultron Organized Play event puts you into the events of this epic story. Rid the world of Avengers and wipe out humanity. Help the Avengers travel into the past and stop Hank Pym from creating Ultron. Travel to the future to stop Ultron from concurring the world. The Marvel HeroClix: Age of Ultron is a four-month storyline Organized Play event that introduces a new resource (The Avengers Round Table) to help players new and old alike fight against (or for) Ultron and his army of robots. Register to play on our event calendar now to reserve your spot! 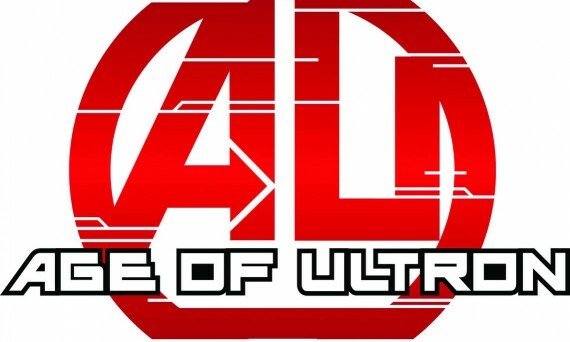 The Age of Ultron Begins on June 27th & June 29th, 2015! 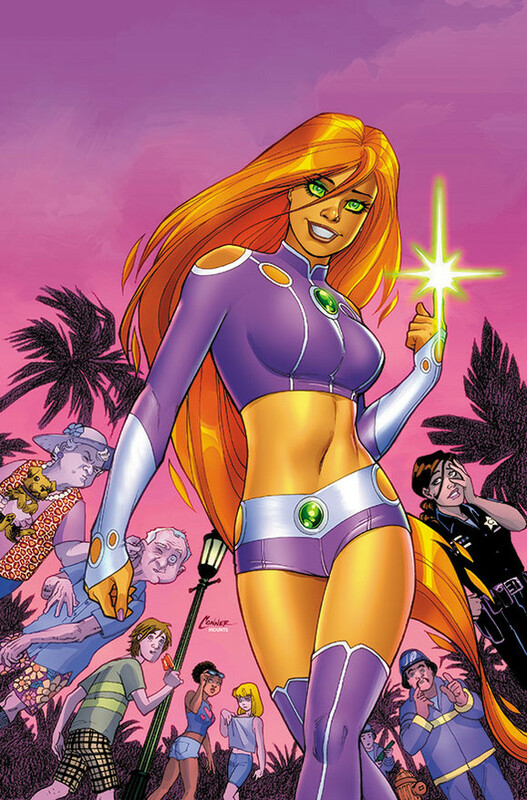 Here is your guide to all of the new DCU #1’s hitting the shelves this June! 32 pg, $2.99 US • RATED T.
The greatest super heroes of all time, unseen since the end of the hit series HITMAN, have returned for the greatest super hero story ever told! Befuddled hero Sixpack returns to Gotham City, desperate to rebuild the all-star team known as Section Eight in the face of a deadly threat. He gathers old friends Bueno Excellente, Baytor and the seemingly reborn Dogwelder, along with some new faces – but he still needs that elusive eighth member. And that’s when the Dark Knight Detective gets an offer he can’t refuse in part one of this unforgettable six-issue miniseries. Hey, remember the panel gutter between panels 3 and 4 of page 20 of HARLEY QUINN #12? What? You DON’T? It’s only, like, the most memorable panel gutter of the twenty-first century. Well, either way, have we got the miniseries for you, in which the full tale of that momentous and momentary pause can be told! It’s a cosmic adventure beyond your wildest imaginings: Power Girl and Harley Quinn, stranded in a forgotten dimension, on the homeworld of the amorous warlord Vartox! They’ll sacrifice anything they have to in order to get home…except their dignity! Kidding! That’ll be the first thing to go. 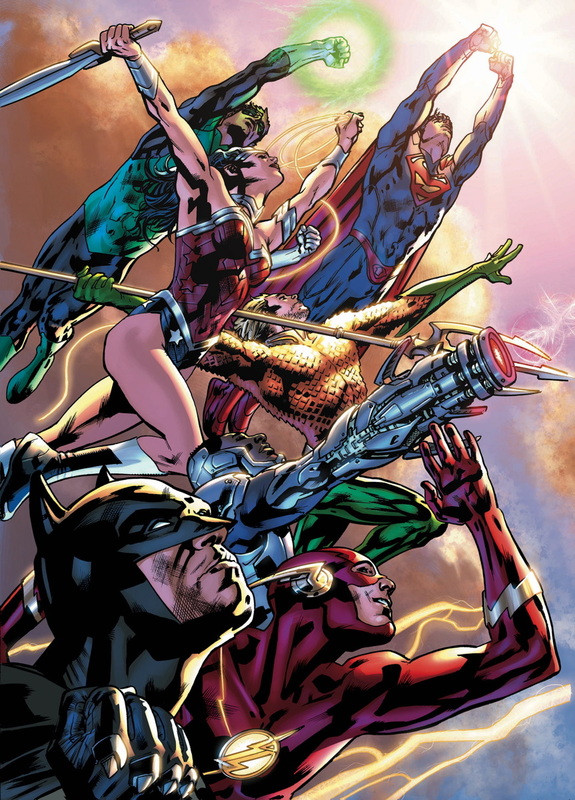 Starring John Stewart, Two-Six, Kilowog and Arisia, and featuring a surprise guest-star we promise you’ll never predict, LOST ARMY is an incredible journey of discovery, survival, morality and heartbreak. Never has the Corps been challenged in this way – and not everyone is going to make it home! Looking through the June issue of Previews, I came across a couple of things that piqued my interest. With Previews being so large I’d like to point out a couple of things that you may have looked over. Written by Nic Kelman and drawn by Pericles Junior. 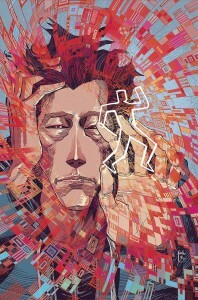 This graphic novel is everything a newly-formed android would need to pass as a human. 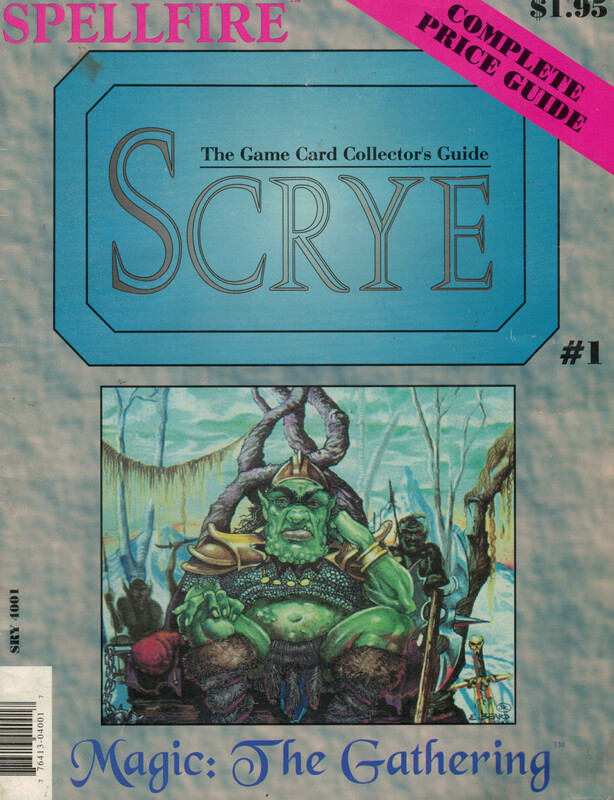 At a whopping 200 pages, it comes complete with schematics, graphics and other useful information to blend in with humans. 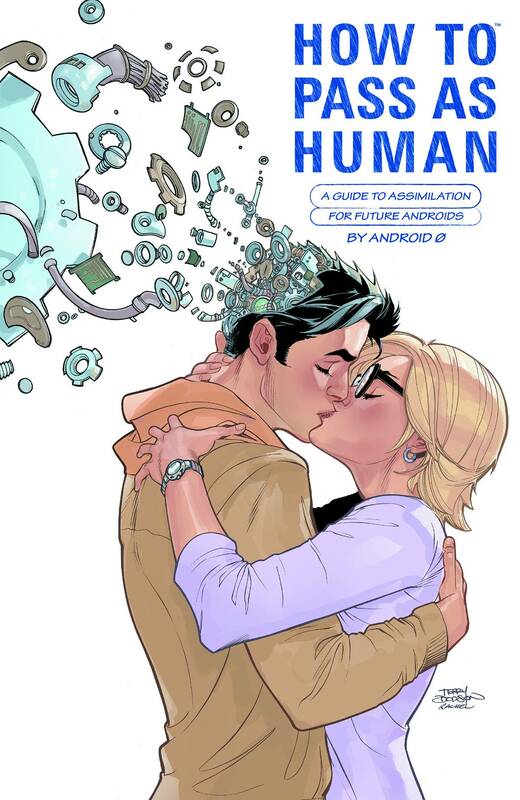 The idea of a graphic novel that helps understand humans from the android’s point of view is very interesting. Just imagine what silicon-based lifeforms would draw or write to explain human anatomy. Written by Justin Jordan and drawn by Jorge Coelho. This miniseries follows John Flood who, due to the result of a government experiment, no longer needs to sleep. An unseen side effect is that he sees patterns that no one else sees, he’s just not sure if what he sees is real or just a waking dream. I’ve always been a fan of mysteries and I’m excited to see what stories Justin Jordan will be able to weave with a character like John Flood.